We offer Jujutsu classes for girls and boys ages 5 and up, taught by Sensei Gina Rossi Rehal and a group of dedicated teachers from our collective. Summer classes are offered during the month of July after the 4th of July weekend. 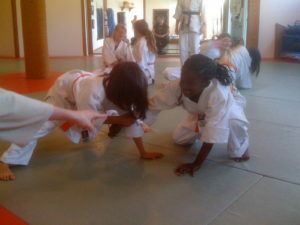 Suigetsukan youth classes offer a safe environment for girls and boys to learn our form of Jujutsu. Through a blend of games, drills and traditional forms training, students get to have fun while gaining all the well-known benefits of an early martial arts training such as improved self-esteem, confidence, focus and healthier bodies. Our Jujutsu is derived from the grappling arts of the Samurai—techniques taught to defend themselves were they to lose their weapons on a battlefield. These techniques have evolved to a modern-day system that continues to pay homage to the character and values of the Samurai warriors, while remaining applicable to the physical and mental challenges young people face today. We believe that martial arts can be beneficial to all kids, and work with each child’s unique gifts to help them realize their potential. There is a lot of hype in the commercial world of martial arts for children; as a non-profit dojo, Suigetsukan makes a point of keeping our focus on working with the kids to get the most out of their experience. Sensei Gina Rossi Rehal began training martial arts at Suigetsukan in 1992. She has been an instructor at Suigetsukan since 2003. She is a fifth degree black belt in Danzan Ryu Jujutsu, a fourth degree black belt in Toyama Ryu Battodo and a third degree black belt in Aikido. Gina taught martial arts and self-defense classes to youth at two Oakland Public Schools. She also teaches self-defense workshops for a variety of community organizations and adult Jujutsu, Aikido and Battodo classes at Suigetsukan Dojo. $50 per month sliding scale (No one will be turned away for lack of funds).